The City of Tallahassee is located in the Panhandle region of northwestern part of Florida and is the capital of of the state of Florida and the county seat of Leon County. Tallahassee (old town, in Apalachee Native American language) has a population of 181,376 in the city limits as recorded by the U.S. Census Bureau and the Tallahassee/Leon County metropolitan area has a population of 367,413. It has rolling hills, canopy roads with big oak trees draped in Spanish Moss. Tallahassee and Leon County Visitor Information Center is a good resource to plan your visit so check out their website for more information. We would like to share some links to local attractions for you, in case you find yourself with extra time on either end of your stay and want to visit the manatees or see some local flora. 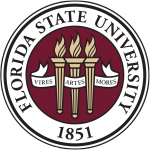 Many locations listed here are within 20-30 minutes of the FSU campus. The surrounding region features a heavily forested, hilly terrain atypical of most of Florida. Five major lakes plus numerous smaller lakes, rivers and springs (including the world acclaimed Wakulla Springs) are within short driving distance from town offer opportunities for water related activities. The nearby shore of the Gulf of Mexico offers broad beaches for recreation and relaxation while the many bays, tidal creeks, and salt marshes with abundant marine and bird life hold the interest of nature enthusiasts and sports lovers. St. George Island, with its wide sugar sand beaches and no high rise buildings, is a great place for a day trip or to spend a few nights. St. George State Park beaches have been named to the top ten list of US beaches for the past three years.